Inspired by Scarf (J Econ Theory 3: 169–181, 1971), Zhao (Int J Game Theory 28: 25–34, 1999), Sandholm (Population games and evolutionary dynamics. MIT Press, Cambridge, 2010) and Yang and Zhang (Optim Lett. 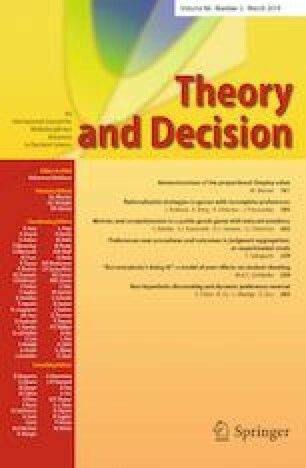 https://doi.org/10.1007/s11590-018-1303-5, 2018), we introduce the model of coalitional population games with infinitely many pure strategies, and define the notions of NTU core and TU core for coalitional population games. We next prove the existence results for NTU cores and TU cores. Furthermore, as an extension of the NTU core, we introduce the notion of strong equilibria and prove the existence theorem of strong equilibria. This research was supported by National Social Science Foundation of China (No. 16XJY021), National Natural Science Foundation of China (No. 11501349), Graduate Innovation sponsored by Shanghai University of Finance and Economics (No. CXJJ-2018-355), and the SUFE Theoretical Economics Gaofeng II Discipline Innovation Project (No. 2018110721).